Spectacular plays on the baseball field happen often, but not many involve flips like this. Texas Rangers prospect Eric Jenkins had to go above and beyond to make sure a batter didn’t get another crack at the plate after that batter smacked a pitch into foul territory. 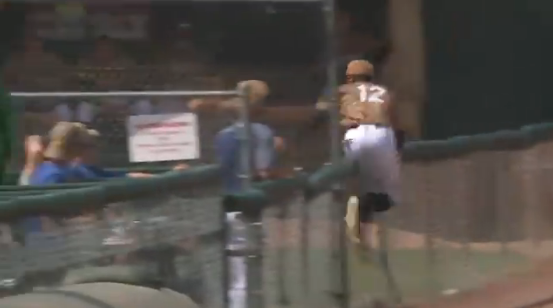 Unfortunately for the hitter, Jenkins had some top notch speed and wasn’t afraid to get a bit dirty as he made the catch while flipping over the fence. He even stuck the landing and delivered the ball back into play in the smoothest way possible.